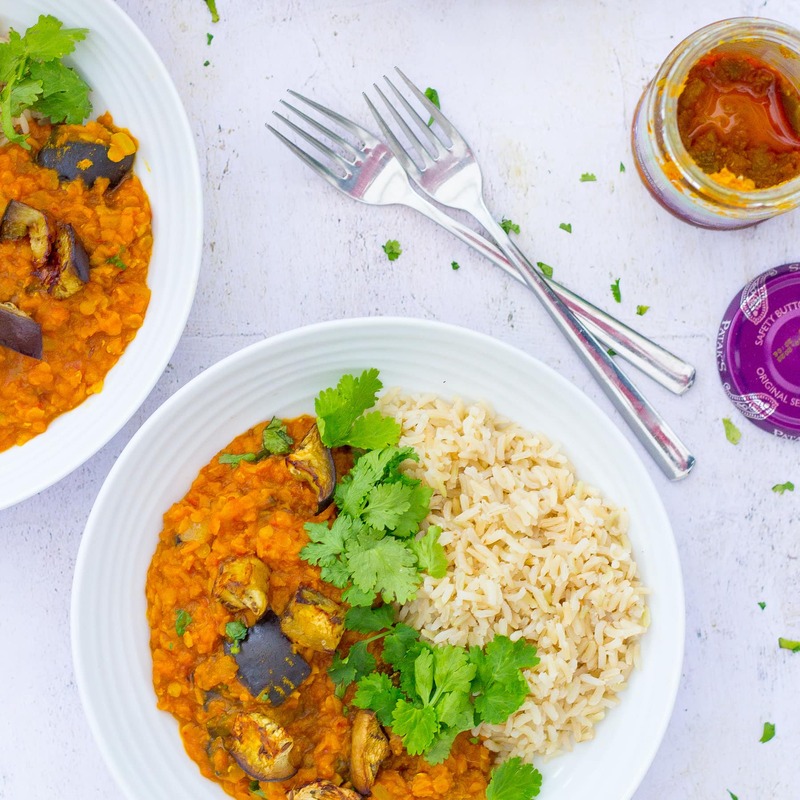 This delicious Roasted Aubergine and Red Lentil Dhal ticks so many boxes – it’s quick and easy to make, family friendly, budget friendly, vegetarian, vegan, gluten free and packed full of goodness! Serve with brown rice for a deliciously virtuous midweek meal! Are you wanting to eat a little more healthily this year – but without compromising on taste or simplicity? Then this Roasted Aubergine and Red Lentil Dhal is definitely a recipe to work into your repertoire. 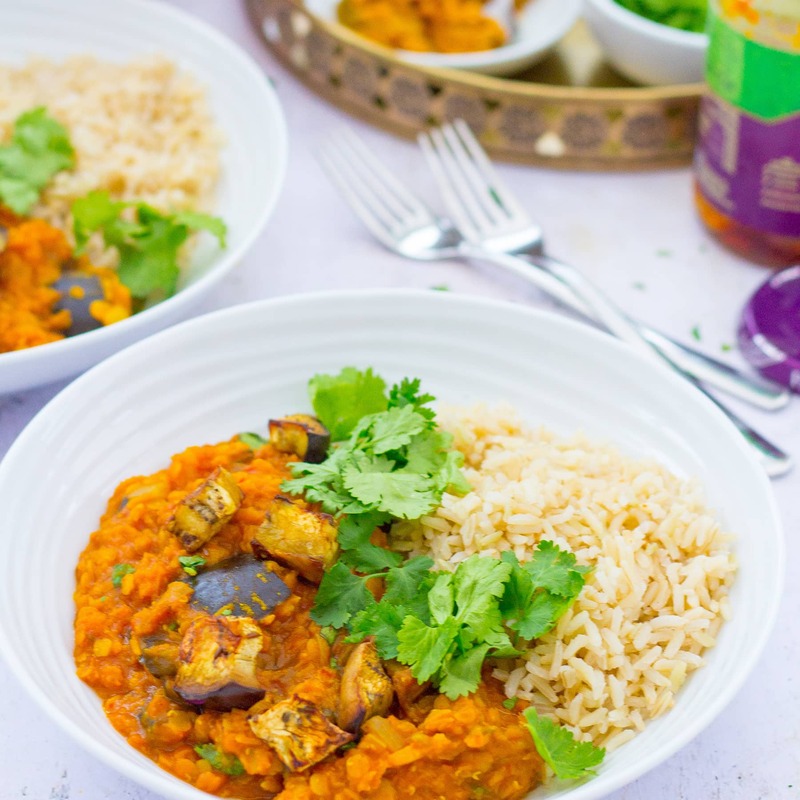 This tasty aubergine and lentil curry is packed full of flavour and takes just 40 minutes to make, but is full of goodness too – only 325 calories (436 kcal including a 100g serving of cooked brown rice), full of fibre, protein, iron and other vitamins and minerals – plus it counts as 3 of your 5 a day! 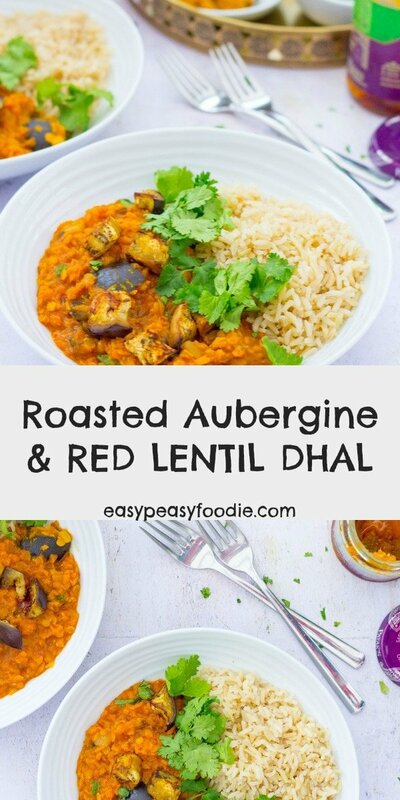 Not only is this Roasted Aubergine and Red Lentil Dhal healthy and easy to make – it’s also family friendly too. I’ve kept the spicing mild and kept ‘funny green bits’ to a minimum! 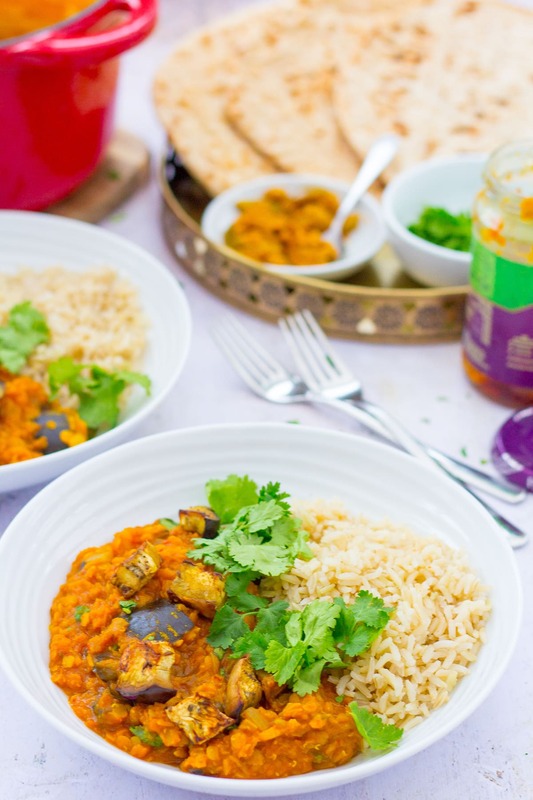 Roasting the aubergines makes them much more tasty, but also makes them super soft – so they almost disintegrate into this curry – so if your kids (or OH!!) is not to keen on aubergines normally, they may not even notice them in this curry! This easy lentil curry got a definite thumbs up from my lot when they tried it the first time – with requests for it to be repeated again very soon! Dhal (sometimes known as dal, daal or dahl) is essentially a curry made from split lentils or other pulses. The world ‘dhal’ comes from the Sanskrit “to split”. Looking at numerous versions online, there are nearly as many versions of dhal are there are cooks – the only thing they all have in common is split pulses and spice (though most also include onions and garlic). My Roasted Aubergine and Red Lentil Dhal is a simplified version of red lentil dhal that can be made using mainly storecupoard ingredients – perfect for a quick and easy midweek meal. Why is red lentil dhal so awesome? Dhal is such a good recipe to have in your cooking arsenal as it does the recipe hat-trick: quick, healthy, budget friendly – so perfect for midweek meals and anyone who’s watching their weight and/or their pennies!! The basic red lentil dhal in this recipe can also be made entirely out of cheap, basic storecupboard ingredients (plus onions, garlic and ginger – which I always have in my fridge). Adding roasted aubergines and a scattering of fresh coriander elevates this humble basic recipe and makes it into a something you could serve at the weekend – or even a dinner party! Red lentil dhal also makes brilliant leftovers – simply store in the fridge and reheat the next day in a saucepan or microwave. Alternatively, water it down slightly and serve the leftover dhal as spicy lentil soup with a big chunk of wholemeal bread! Absolutely! This Roasted Aubergine and Red Lentil Dhal was MADE for batch cooking and freezing. You could make a big vat of this at the weekend – split it into portions and pop them into the freezer and feel very smug, knowing that you have a freezer full of healthy ready meals for when you need them. To freeze, simply cool and divide into plastic boxes. Pop the lids on (and don’t forget to label them! ), then stick them in the freezer until you need them. You can even defrost from frozen! To defrost this red lentil dhal from frozen, simply pop the frozen dhal into a saucepan with a small amount of water. Stick the lid on and cook over a low heat until defrosted and piping hot all the way through. Alternatively, if you remember, get the dhal out of the fridge the night before you need it and pop it in the fridge. Heat the defrosted dhal in a saucepan or microwave until piping hot all the way through. My favourite way to serve this Roasted Aubergine and Red Lentil Dhal is with brown rice, but there are lots of other options! You could serve this dhal with white rice, pilau rice, chapattis, naan breads or, if you want to feel super virtuous, why not serve this dhal with my Easy Pilau Cauliflower Rice? 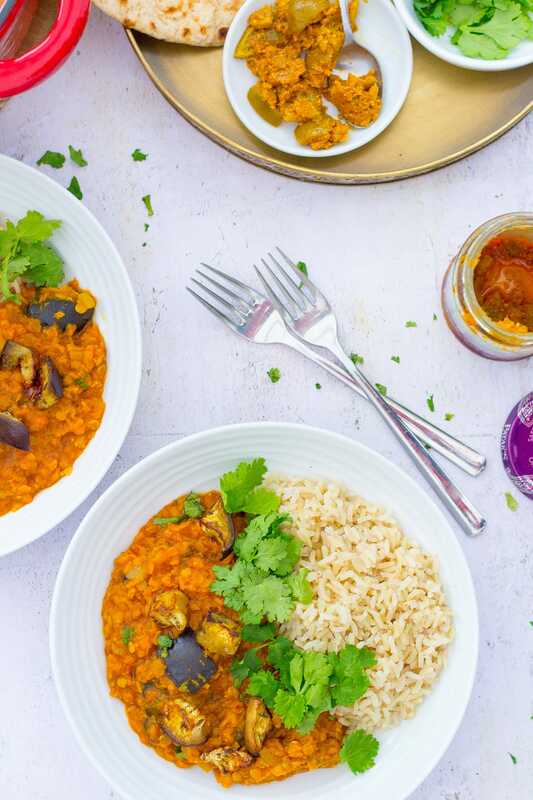 This delicious Roasted Aubergine and Red Lentil Dhal ticks so many boxes – it’s quick and easy to make, family friendly, budget friendly, vegetarian, vegan, gluten free and packed full of goodness! Serve with brown rice for a deliciously healthy midweek meal! 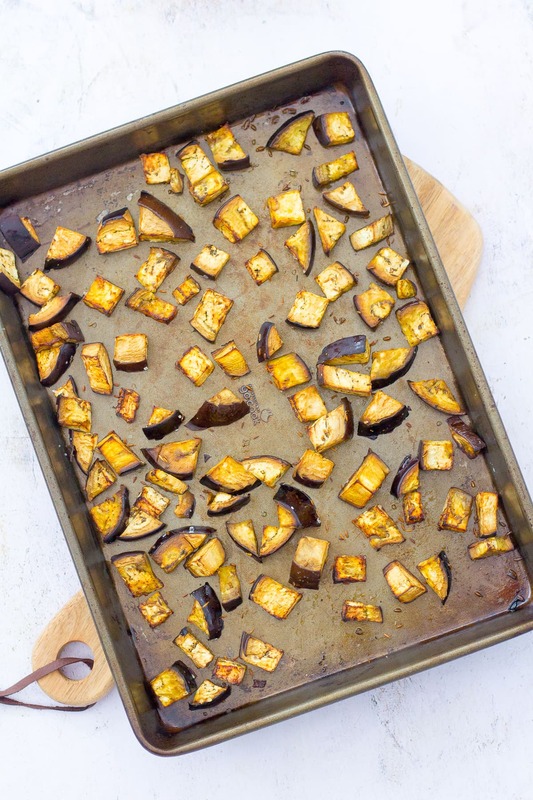 Place the diced aubergine in a single layer on a large non-stick baking sheet. Drizzle over the olive oil and scatter over the salt and cumin. Use your hands to mix everything together and rearrange as a single layer. Place in your preheated oven for 20 minutes – turning once to prevent sticking. Meanwhile, put the onions and olive oil in a deep, wide pan and cook the onions over a low heat with the lid on for 5 minutes, or until softened but not brown. Stir occasionally. Add the chilli, garlic, ginger, turmeric and garam masala and cook over a gentle head for 2 minutes, stirring occasionally. If the pan gets too dry add a splash of cold water. Add the lentils, chopped tomatoes, water and black pepper. Stir and bring to the boil. Lower the heat and cook for 30 minutes (with the lid on). Check on the dhal occasionally and add extra water if necessary. 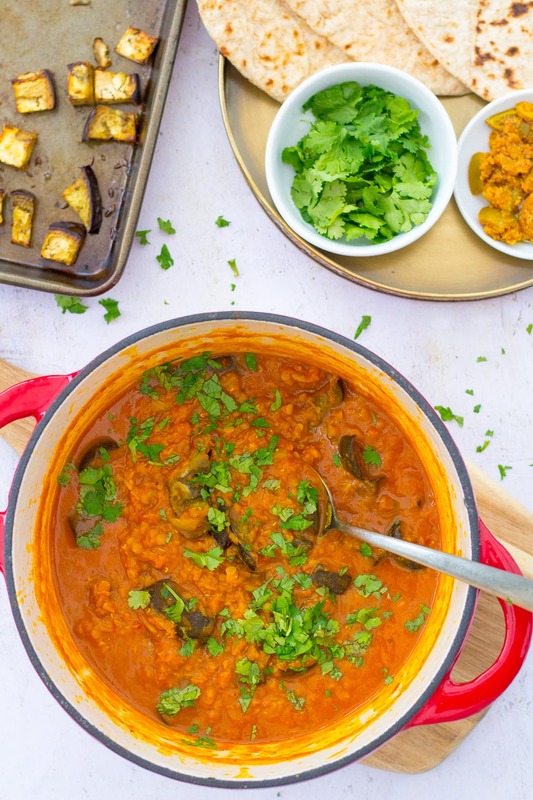 When the dhal is cooked, stir in the fresh coriander and roasted aubergine – saving a few pieces for garnish (or not if you’d rather hide the fact that there are aubergines in this curry!!). Serve scattered with a few pieces of aubergine and some extra fresh coriander. Oooo I love dahl! I was just talking to my brother about making one for him next time we see each other for dinner (he made a very delicious nut roast last time I saw him!) so I’ll pop this on our list! I love dahl and aubergine so this looks yummy. 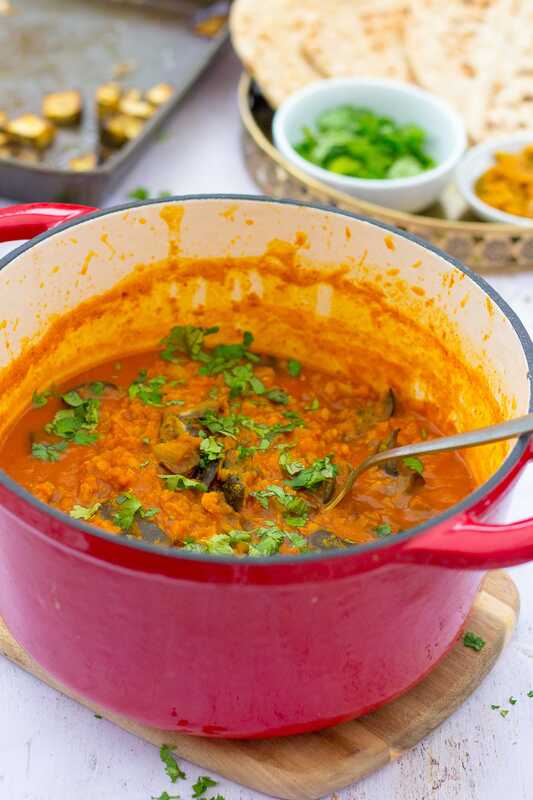 I can’t get the rest of my family to eat aubergine but they’d devour the dhal and I could eat all their aubergine and my dhal – sounds like a plan! So I did make it and we loved it. Did one evening meal and several lunches! If i made it again I would double the aubergine because it is one of my fav vegetables but all in all a fabulous recipe as it is Thank you. This looks delicious and so comforting for a winter evening!